1Sanglah Hospital, Udayana University, Denpasar, Bali, Indonesia. 2Pediatric Department, Faculty of Medicine, University of Indonesia, Cipto Mangunkusumo Hospital, Jakarta, Indonesia. 3Pharmacology Department, Faculty of Medicine, University of Indonesia, Cipto Mangunkusumo Hospital, Jakarta, Indonesia. 4Pathology Clinic Department, Faculty of Medicine, University of Indonesia, Cipto Mangunkusumo Hospital, Jakarta, Indonesia. 5Pediatric Department, Faculty of Medicine, University of Padjajaran, Hasan Sadhikin Hospital, Bandung, Indonesia. 6Nutrition Department, Faculty of Medicine, University of Indonesia, Cipto Mangunkusumo Hospital, Jakarta, Indonesia. 7Pediatric Department, Faculty of Medicine, University of Udayana, Sanglah Hospital, Bali, Indonesia. Full-term, Ibuprofen, IPF, Patent ductus arteriosus, PGE2, VEGF. Ductus Arteriosus (DA) is a shunt connection between the main pulmonary artery and the proximal descending aorta in utero. Patent Ductus Arteriosus (PDA) defined as the failure of DA closure within 48 h after birth. Patent ductus arteriosus is one of the most common congenital heart disease in the neonatal period . Mechanism of PDA remains unclear, but mostly due to structural abnormality of DA smooth muscle cell . In contrast to preterm neonates, the role of prostaglandin E2 (PGE2) in functional ductal closure among full-term neonates is still debatable . Hypoxia may induce vascular endothelial growth factor (VEGF) secretion and regulate the remodeling process during anatomical closure of DA . The role of platelets in maintaining the patency of DA is still controversial. Patent ductus arteriosus can be caused by lack of platelets accumulation . Total platelets may correlate to the proportion of immature platelets fraction (IPF). Under normal states, the more platelets being used, the higer the percentage of IPF. The measurement of IPF is rarely performed in neonates, although it may be innovative and reliable . Further, molecular pathogenesis of PGE2, VEGF and platelets (IPF) role in the full-term ductal patency remains unclear. Possible mechanism of action of those markers on PDA could influence the future pharmacological treatment in full-term neonates. Patent ductus arteriosus provides significant hemodynamic consequences, which in turn affect the management. There is no standard treatment for PDA in full-term neonates with hemodynamic disturbance symptoms in early life including the use cyclooxygenase (cox) inhibitor . The effectiveness of oral ibuprofen at 10 mg/kg on day one, and followed by 5 mg/kg on day two and three varied and there is no evidence from clinical trial study [1,8,9]. Therefore, in this study we evaluated the role of PGE2, VEGF and platelets (IPF) in the full-term ductal patency and the effectiveness of oral ibuprofen in ductus arteriosus closure among full-term neonates. This study took place at three hospitals, i.e., Sanglah General Hospital, Prima Medika Hospital, and Wangaya Hospital, in Denpasar, Bali. It was conducted from March to October 2015. We divided the study into two sections according the design and purpose. The first section was a cross-sectional study on the role of PGE2, VEGF and IPF in DA patency and the other one was a double-blind randomized controlled trial of the effectiveness of oral ibuprofen in full-term neonates with PDA. We obtained the approvals from the Sanglah General hospital’s Ethics Committee (Trial number 403/UN.14.2/Litbang/2015) and Wangaya Hospital’s Ethics Committee (Trial number 5/PAN-ETIK/IV/2015). All subjects were enrolled in the study after parental informed consents had been gained. This study considered for enrollment all full-term neonates aged ≥ 48 h with and without PDA using consecutive sampling methods. Sample size calculations was done according to the formula with power 80%, Zα=1.96, Zβ=0.842, minimal significant diameter 2.3 (SD 0.2) mm and 2-tailed correlation (r) between PGE2 and duct diameter 0.5; minimum 28 participants were needed for each group . Subjects who met inclusion criteria were performed echocardiography. In the first design, subjects were divided into group 1 (PDA) and group 2 (non-PDA). Blood samplings were obtained for measurement of PGE2, VEGF, and IPF. Creatinine was measured in subjects with PDA. Measurement of PGE2 and VEGF was done using R&D systems Inc.®, Minneapolis, USA, while the IPF (%) was done using flow cytometer with Sysmex XN 1000®. Echocardiography was performed by using Vivid 7, General Electric® with 10s probe by two validated pediatric cardiologists. A double-blind permuted-block randomization controlled trial using blocks of size 4 was performed for the second section of the study. A concealed random allocation was done by a pharmacist and subjects were divided into group 1 (the ibuprofen arm) and group 2 (the control arm). Subjects in-group 1 were given 10 mg/kg of oral ibuprofen suspension on day one, and followed by 5 mg/kg on day two and three respectively. The medicine was given through a nasogastric tube. The control group received placebos in exactly similar packages, schedules, and methods of administration. Clinical evaluations of the hemodynamic changes, the amount of fluid intake, fluid balance, and adverse effects were assessed every day. Echocardiography and blood examinations were performed at the fourth day. Data were analyzed using the Statistical Packages for the Social Sciences (SPSS). A descriptive analysis was done to elaborate subject demographics and clinical data. The independent t-test was applied to determine mean difference of prostaglandin, VEGF, IPF values between PDA and non-PDA groups and also PDA diameter post treatment between ibuprofen and placebo groups. A general linear model (GLM) was applied to analyzed a repeated measurement of fluid intake and fluid balance and Pearson correlation also applied to determine the correlation between PGE2 and ductal diameter. A p-value of 0.05 was used as the cut-off to determine significant associations. A total of 135 full-term neonates were consecutively selected and examined with echocardiography. Based on this initial evaluation, we identified 64 neonates with PDA (which were then categorized as the “PDA group”) and 69 others without PDA (“non-PDA group”). Two patients were excluded from the study due to dysmorphic features and parental refusal. All 64 neonates with PDA were enrolled in the first section of the study, while the second section only included 32 neonates. Three subjects were dropped out. We analyzed fifteen and fourteen subjects in ibuprofen and placebo group, recpectively (Figure 1). Figure 1. The flow diagram. The mean age of subjects enrolled in this study was 48 h old. Both groups had similar characteristics, most subjects did not require oxygen and antibiotic therapy. There was no subject with major or minor risk factors for infections, whose mother was diabetic and with history of maternal steroid therapy. There were no differences in echocardiographic results, total fluid intake, axillary temperature, characteristic of hematological parameters (hemoglobin and leukocytes) between the two groups (Table 1). Note: SpO2: Peripherally Oxygen Saturation; CPAP: Continues Positive Airway Pressure; LA/Ao: Left Atrium/Aorta Ratio; PDA: Patent Ductus Arteriosus; LVEF: Left Ventricle Ejection Fraction; SD: Standard Deviation. Table 1. Characteristics of subjects in PDA and non PDA group. The level of PGE2 was significantly higher in PDA group compared with non-PDA [2113.3 (SD 950.4) vs. 1605.8 (SD 683); p=0.017]. There were no differences in VEGF levels and the percentage of IPF between both groups (Table 2). There were eight subjects in ibuprofen group and 10 subjects in placebo group experienced PDA closure after treatment. However, the independent t-test analysis showed that the mean diameter of PDA between boths group were similar [1.6 (0.7) mm vs 1.9 (0.9) mm, p=0.364, 95% CI -0.27 (-0.8 to 0.3) mm]. The Correlation analysis showed that there was a moderately significant positive correlation between mean difference of prostaglandin’s level and mean difference of PDA’s diameter (r=0.484, p=0.008). Note: *Unpaired t test, statistically difference (p<0.05), # geometric unpaired t test, not statistically significant (p> 0.05). Table 2.Comparison of PGE2, VEGF and IPF levels on the subject with PDA and non PDA. During the intervention period, there was a tendency of respiratory rate decline in the ibuprofen group every day. 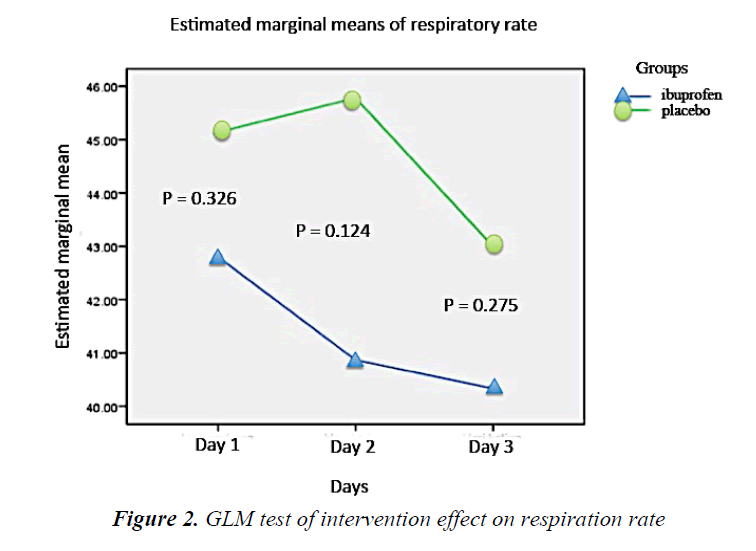 On the other hand, the respiratory rate of the placebo subjects increased at the second day but eventually declined the following day. However, such fluctuation was not statistically significant (Figure 2). The heart rate of the ibuprofen and placebo group showed a downward trend over the first, second, and third day, but it was not statistically significant (Figure 3). Figure 3. 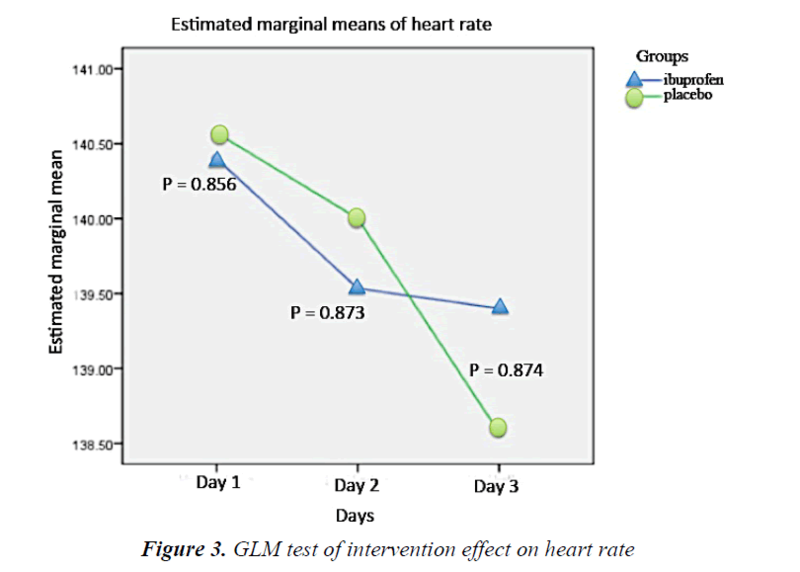 GLM test of intervention effect on heart rate. There were no differences of PGE2 level before and after treatment between both ibuprofen and placebo groups (Table 3). Adverse effects evaluations were conducted every day for the ibuprofen and placebo group. There were no differences in the amount of diuresis over the whole 3 days of intervention between both groups. No subject was recorded to have experienced oliguria, necrotizing enterocolitis (NEC) and intraventricular hemorrhage (IVH) following the intervention (Table 4). High level of PGE2 can serve as a signal to activate EP4 receptor that modulates the function of Kv channels. This mechanism will result in relaxation of DA . EP4 receptor plays an important role in human DA patency during the third trimester of pregnancy . Prostaglandins and nitric oxide (NO) has been known as vasodilators that can sustain the fetal DA and DA’s contraction inhibition role in in vitro study . Our study was unable to prove the role of VEGF in DA patency. DA smooth muscle cells are depleted during the closure, proliferation, and apoptosis in order to complete the closing process. The VEGF activation in a permanent closure take place at the age of 1-3 weeks of life . In this study, the VEGF examination was performed at 48 h or third day of life and this might explain the insignificant difference of VEGF level between the PDA and non- PDA group. The Migration and proliferation of smooth muscle cells occurs during the anatomical closure of DA. A Study on rats indicates expression of Epac1 and Epac2 through a Polymerase Chain Reaction (PCR) analysis. The Epac concentration increases along with the increasing gestational age of mice. The PGE2-EP4 signals activate the cyclic adenosine monophosphate (cAMP) pathway, both Epac and PKA, and thus synergistically causes the Intimal Cushion Formation (ICF) in the DA . This study did not investigate the role of Epac, but we suggest that it is likely to become an important factor for the anatomical DA closure besides the hypoxia-induced VEGF expression. This study was also unable to prove the differences of IPF, which is a new method for reticulated platelet measurement. A study on term primate neonates showed that platelet thrombi are not found within the first day of life and rarely found in the first week after birth. This result showed that the role of platelets in the DA closure is not important in full-term neonates . However, this result probably due to low capacity to evaluate the role of IPF at the age of 48 h of life. There are several reasons why PDA becomes unresponsive to the administration of Non-Steroidal Anti-Inflammatory Drugs (NSAIDs). The inflammatory process in the wall of a DA occurs soon after birth. It is associated with the influx of monocytes or macrophages into the walls of the DA which later induces the prostaglandin and NO-independent cytokines-mediated vasodilation . An antiPGE2 treatment on the ductal ring at 2 h of life provides significant vasoconstriction results. However, after 4 h of life, this vasoconstrictor effect disappears possibly due to the loss of PO2 response and the decrease of the DA diameter that happen naturally. In addition, one day after birth, along with the growth of vasa vasorum, NO is produced and may induce DA patency in a greater extent compared to prostaglandin so that patients become less responsive to NSAIDs . Another mechanism that leads to the DA closure in both groups was an increase in PO2 after birth . These results are consistent with a previous study on preterm which showed decreased levels of plasma PGE2 that only occurred in 2 h after ibuprofen administration and stable at 48 h following the ibuprofen administration . At a standard dose of 10 mg/kg on day one and 5 mg/kg each on day two and three, the effectiveness of ibuprofen was not better than the placebo and PGE2 levels did not decrease in the ibuprofen group. It is possible that we failed to see the effect of ibuprofen because the given dosage was still below the therapeutic threshold. A study comparing the effect of 5, 10, 15 and 20 mg/kg of intravenous ibuprofen given to preterm neonates showed that the 20 mg/kg regimen was associated with a higher probability of DA closure. Unfortunately, this dose also created renal adverse effects [17,18]. However, the oral high-dose ibuprofen regimen (20-10-10 mg/kg/d) seems to be more effective than standard dose regimen for PDA closure among premature neonates without increasing the adverse effects . The effect of varied regimen and route of ibuprofen administration in full-term PDA must be still clarified. No events of oliguria, NEC, and IVH were recorded in both groups. The incidences of jaundice were similar in both groups and this may be due to physiological hyperbilirubinemia. Adverse effects on the kidney were trivial and no subject showed signs of oliguria and increased creatinine levels. This result is consistent with another study in preterm neonates [19,20]. There are at least two limitations of this study. First, the dose of ibuprofen was following the preterm standard regimen. Second, drug responses can vary in different individuals, the presence of genetic polymorphism that can determine different clinical and side effects, and the pharmacodynamics and pharmacokinetic profile of ibuprofen in full-term neonates suggesting have some influence on inter-individual variability in ibuprofen response which were not evaluated in this study. A high level of PGE2 appears to play a pivotal role in DA patency of full-term neonates. Administration of oral ibuprofen in 10-5-5 mg/kg schedule could not induce PDA closure in full-term neonates. Anggreni M, Yantie NPVK, Suradi GER, et al. Closure of patent ductus arteriosus with ibuprofen in aterm neonate. Proceedings of Kongres Nasional Ilmu Kesehatan Anak XVI; 2014; Palembang. Indonesia: Pediatr Indones 2014. Schneider DJ, Moore JW. Patent ductus arteriosus. Circulation 2006; 114: 1873-1182. Fenling F, Aiqun M, Youfei G, et al. Effect of PGE2 on DA tone by EP4 modulating kv channels with different oxygen tension between preterm and term. Int J Cardiol 2011; 147: 58-65. Waleh N, Seidner S, McCurnin D, et al. Anatomic closure of the premature patent ductus arteriosus: the role of CD14+/CD163+ mononuclear cells and vascular endothelial growth factor (VEGF) in neointimal mound formation. Pediatr Res 2011; 70: 332-338. Echtler K, Strack K, Lorenz M, et al. Platelets contribute to postnatal occlusion of the ductus arteriosus. Nat Med 2010; 16: 75-81. Haiyoung J, Hee-Kyung J, Hee-Jin K, et al. Immature platelet fraction: Establishment of a reference interval and diagnostic measure for thrombocytopenia. Korean J Lab Med 2010; 30: 451-459. Takeshi T, Hithosi Y, Tadashi K, et al. Usefulness of indomethacin for patent ductus arteriosus in full-term infants. Pediatr Cardiol 2007; 28: 46-50. Meibner U, Chakrabarty R, Topf HG, et al. Improved closure of patent ductus arteriosus with high doses of ibuprofen. Pediatr Cardiol 2012; 33: 586-590. Amoozgar H, Ghodstehrani M, Pishva N. Oral ibuprofen and ductus arteriosus closure in full-term neonates: A prospective case-control study. Pediatr Cardiol 2010; 31: 40-43. Rheinlaender C, Weber S, Sarioglu N, et al. Changing expression of cyclooxygenases and prostaglandin receptor EP4 during development of human ductus arteriosus. Pediatr Res 2006; 60: 270-275. Seidner SR, Yao Qi C, Oprysko PR, et al. Combination prostaglandin and nitric oxide inhibition produces anatomic remodeling and closure of the ductus arteriosus in the premature newborn baboon. Pediatri Res 2001; 50: 365-373. Boekenkamp R, DeRuiter M, Van Munsteren C, et al. Insight into the pathogenesis and genetic background of patency of the ductus aretrisosus. Neonatology 2010; 98: 6-17. Yokoyama U, Minamisawa S, Ishikawa Y. Regulation of vascular tone and remodeling of ductus arteriosus. J Smooth Muscle Res 2010; 46: 77-87. Clyman R, Chemtob S. Vessel remodeling in the newborn: Platelets fill the gap. Nat Med 2010; 16: 33-34. Hermes-DeSantis ER, Clyman RI. Patent ductus arteriosus: Pathophysiology and management. J Perinatol 2006; 26: 14-18. Dorval V, Martin BZ, Brssard M, et al. 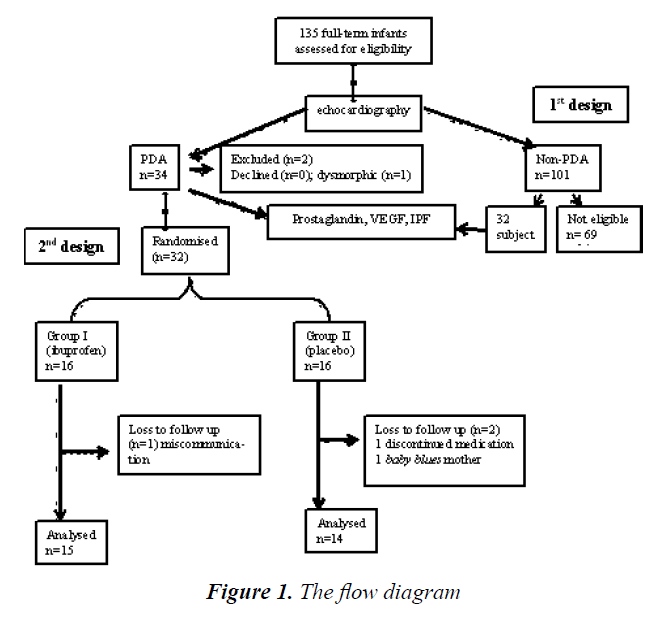 Plasma prostaglanding E2 and mesenteric Doppler flow measurements after oral and intravenous ibuprofen treatment of patent ductus arteriosus in preterm infants: a pilot study with double-blind randomized controlled methodology. J Neonatol Res 2012; 2: 3-12. Desfrere L, Zohart S, Morville P, et al. Dose-finding study of ibuprofen in patent ductus arteriosus using the continual reassessment method. J Clin Pharm Ther 2005; 30: 121-132. Pourarian S, Rezaie M, Amoozgar H, et al. High-dose oral ibuprofen in treatment of patent ductus arteriosus in full-term neonates. Iran J Pediatr 2015; 25: 1-5. Pourarian S, Takmil F, Cheriki S, Amoozgar H. The effect of high-dose ibuprofen on patent ductus arteriosus closure in preterm infants. Am J Perinatol 2015; 32: 1158-1163. Fanos V, Antonucci R, Zaffanello M. Ibuprofen and acute kidney injury in the newborn. Turk J Pediatr 2010; 52: 231-238.